Would your child like to try out a new sport, or get better at one they already play? 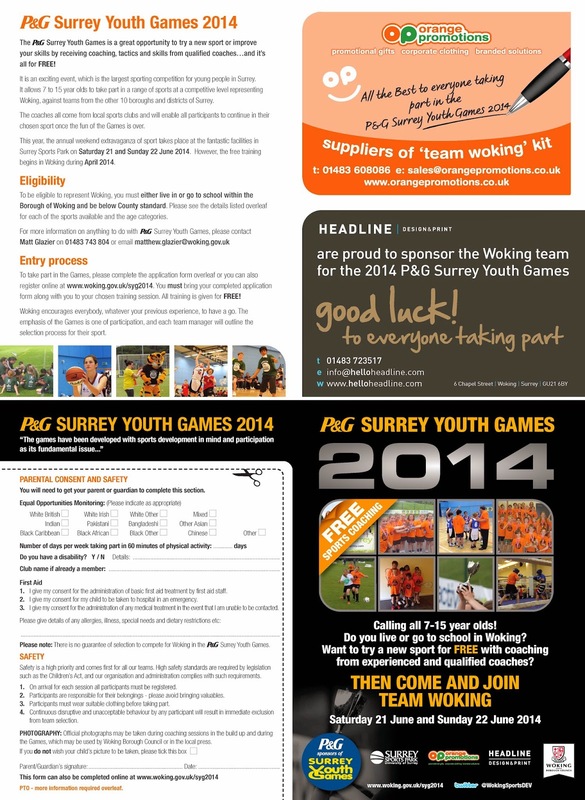 The P&G Surrey Youth Games offers free coaching at a venue close to you. From April to June, free coaching courses are running across Woking for children aged 7-16. Sports include badminton, basketball, boccia, boxing, cricket (girls only), football (girls only), hockey, judo, lacrosse, netball, rugby (girls only), squash, swimming, table tennis and tennis. Coaching sessions take place at schools, clubs and leisure facilities across the Borough. They are organised by Woking Borough Council’s Sports Development Officer in conjunction with local club or sports centre coaches. Each session is led by fully qualified coaches and takes place after school or at the weekend. 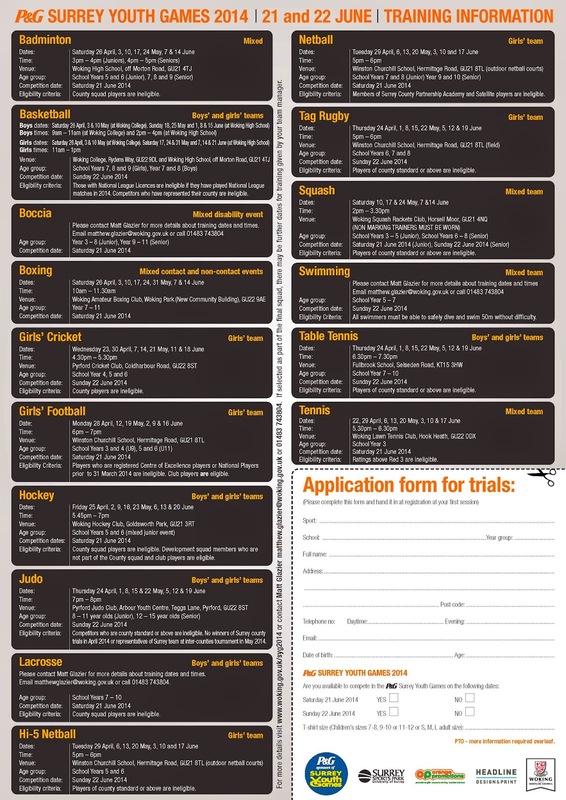 At least 6 sessions are offered for every sport. There are lots of good reasons for coming along. This could be the start of a life-long love of a sport, a chance to meet new people and make new friends. Over half of people join a club afterwards and continue to enjoy the sport for years to come. It’s a great way to become more active and develop a healthy lifestyle. Each child attending the coaching sessions has a chance of being selected to represent their borough or district at the P&G Surrey Youth Games 2015 on 20 and 21 June. Taking place at the World-Class Surrey Sports Park, the weekend is an extravaganza of sport, and provides an inspiring experience of an Olympic style event. All 11 boroughs or districts compete in 15 different sports over the two days of the event, with 2000 people taking part over the weekend. With 28 events, there is plenty of non-stop action. In keeping with Olympic tradition, the top three teams in each event receive gold, silver or bronze medals. Competitors are inspired by visits from previous international competitors who show off their England tracksuits, medals they have won and most importantly share their stories of how they have reached the top. The coaching sessions are free to attend for anyone below county standard in their chosen sport who lives or goes to school in Woking. Details of training venues, dates and times are available at www.woking.gov.uk/syg or by contacting Matt Glazier on matthew.glazier@woking.gov.uk or 01483 743804.